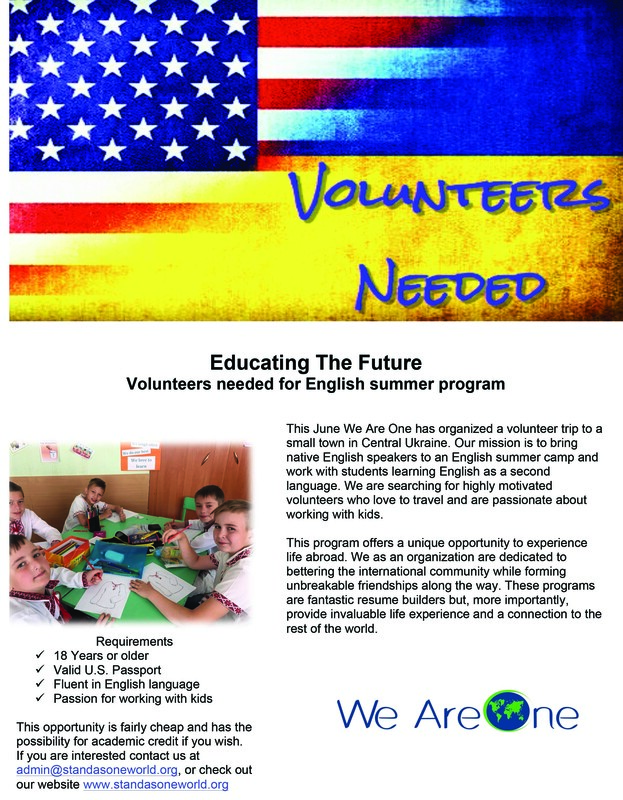 This June ‘We Are One‘ has organized a volunteer trip to a small town in Central Ukraine. Their mission is to bring native English speakers to an English summer camp and work with students learning English as a second language. They are searching for highly motivated volunteers who love to travel and are passionate about working with kids. This program offers a unique opportunity to experience life abroad. ‘We Are One’ organization is dedicated to bettering the international community while forming unbreakable friendships along the way. These programs are fantastic resume builders but, more importantly, provide invaluable life experience and a connection to the rest of the world. If you are interested contact ‘We Are One’ organization at admin@standasoneworld.org, or check out their website www.standasoneworld.org.